When tragedies occur, such as the appalling bus crash in Ecuador which killed four young English students and their tour leader, it is only natural for parents to attach a stigma to the country where it happened and try to deter their child from travelling there. Alas, fatal accidents happen the world over — not just in developing countries — and to discourage your child from taking a once-in-a-lifetime trip to an amazing part of the world could be a mistake. 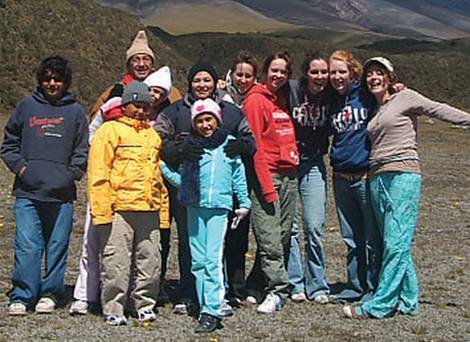 I went to Ecuador for nine weeks during the summer of 2006 with four friends. The trip was our first experience of an economically developing country, and it opened our eyes to something completely different from our day-to-day college existence. We had a vague plan of volunteering and travelling, but we had no idea what to expect. It took a few days to adjust to the high altitude of Quito and even longer to find accommodation for the six weeks we planned to stay in the capital. We finally found a place that we affectionately called ‘the Commune’, where we rented two rooms from some Quechua Indians. Still without a purpose, we scouted out some volunteering centres. We came upon three in the north of Quito and signed up to volunteer for a month. We worked with children of all ages — those with weaker Spanish worked with babies who couldn’t speak yet, and some of us worked with kids aged between 6-18 years. Volunteering was definitely one of the highlights of the trip — the kids completely won us over (and we eventually won them over with chalk, piggy-backs and skipping ropes). They were amazing, and we seriously considered trying to bring them back to Ireland with us. We travelled during the weekends, and often decided late on Friday nights to go to the bus station and leave the city for a few nights. We went to places such as the Equator Line, Banos (famous for its thermal baths heated by a volcano that erupted three weeks after we left) and Otavalo (renowned for its Saturday market). The late-night buses were definitely an experience — we had rocks thrown through windows, soldiers ordering us off buses to search us, Bible-bashers shouting at us, and strangers pretending to work for the bus companies and conning us of our money. The day-time trips were sometimes worse as you could actually see the bends the bus was making on the mountainous terrain. But it was the Ecuadorians themselves who really made our trip. Everywhere we went the locals, particularly the indigenous communities, embraced us, possibly because the country has not yet been inundated with tourists. The World Cup was on and Ecuador did really well, which generated an infectiously happy atmosphere. Without exception we were befriended and helped by locals in each place we visited, and we often ended up being taught how to salsa or playing cards and beach volley ball with the natives. One memorable encounter was when we visited the snow-covered Cotopaxi volcano. We refused to pay $10 to be driven to the base of the volcano (so in tune had we become to the local rip-offs) and decided to walk instead (not realising that it was 30km). Eventually an Ecuadorian family picked us up and agreed to come to the volcano with us. We ended up singing renditions of Unbreak My Heart in Spanish with the family. We backpacked for the last three weeks of the trip, and again got ourselves in scenarios our parents would not have been happy with. Riding on the tops of trains and hitch-hiking were our regular forms of transport. We went to the jungle for a week and went white-water rafting down the Amazon with a man called Tomás who thought it was very amusing to throw us into the water as we hurtled down rapids. At one point, we had to cross the treacherous river (made worse by flooding) by foot to get to the other side and were literally dragged one by one by our guide across the Amazon. Our nine weeks spent in Ecuador will never be forgotten — we still have Ecuador reunions regularly and reminisce about all the people we met and the adventures we unknowingly undertook. If your child is thinking of taking a gap year and going away for the summer to a developing country, encourage them. The experience will serve as an invaluable education as they explore new cultures in what will be an often challenging, but always memorable trip.